Rockport Grey. Everyone’s favorite neutral. I (well, my first husband and I) bought my first home in 1985. He wouldn’t let me go wild and paint the whole house to suit myself. I was stuck with the color scheme, but managed to tweak the wallpaper in a r0om or two. Ditto the next house. We bought the third one under construction, but the builder had already had it decorated and we were stuck with the colors. They were pretty but not mine. It’s true. I dream in color. Technicolor. I have vivid dreams that include full color, texture and even smells. I often remember my dreams in great detail, and have done so all my life. I’ve also dreamed since buying that first house of decorating an entire home with one basic neutral color with different color accent walls in the various rooms. I wanted a house with calm, soothing gray walls since the late 1980s. I planned it since the 1990s. New husband, another new home under construction, and AGAIN, the decorator has had at it. The scheme is REALLY close to the previous home with the old husband (burgundy and a lighter green). I did get to choose the flooring and the lights. I still have the 24K gold chandelier from that home (I always wanted one–it was part of my little girl “princess fantasy”). Chad and I moved that fixture 3 times. It’s in a box. Want it? FINALLY, several years later, we bought a home 1000 miles away with enough funds left over to hire painters and repaint from top to bottom. We had to. The prior owner, a sunny, vapid blonde, had decorated in BRIGHT, blinding yellow and grass green. I couldn’t stand it. The little girl’s room was so pink the walls glowed. Her son’s room was a blue light district. I went to Benjamin Moore, bought quality paint, hired professional painters, and have colors that, TEN years later are, funny enough, all the rage. I selected Rockport Gray (HC-105 http://www.benjaminmoore.com/en-us/paint-color/rockportgray) for my all over neutral. My painter thought I was nuts. It’s warmer than typical gray, with a taupe-y undertone. I admit that in the basement it’s a little too dark. In the bedroom with red curtains it gets a tad rosey. I’m making plans to put a glaze over the bedroom walls to brighten it up a bit. The bedroom in Rockport Grey. Depending on the window treatment (I change it often) the room can be a bit dark. On the main floor, that Rockport Gray is phenomenal. 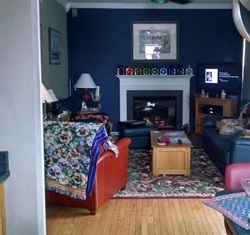 I used Old Navy (2063-10 http://www.benjaminmoore.com/en-us/paint-color/oldnavy#ce_s=navy) for opposing accent walls in the den and kitchen. The dining room has eye-popping Raisin Torte ((2083-10 http://www.benjaminmoore.com/en-us/paint-color/raisintorte) below the chair rail. We (hubby and I) painted an awning striped accent wall in the living room over a holiday weekend, and still came away kissing…that speaks volumes about our marital relationship and how we communicate. I’ve since learned that you need to press that masking tape down with a credit card to keep the edges from bleeding, but it looks great from at least 2 feet away! Many people have wondered how we found wallpaper that matches our paint so well! Painted awning stripe accent wall in Raisin Torte and Old Navy over Rockport Grey. I pulled in a few side by side comparisons of the before and after shots. OMG the yellow! Friends, if you are marketing your home, either pony up the money to paint over your beloved bright colors down to neutral, or hope that your buyer has both the imagination and money to paint, as I did. That yellow just about turned me off this home. 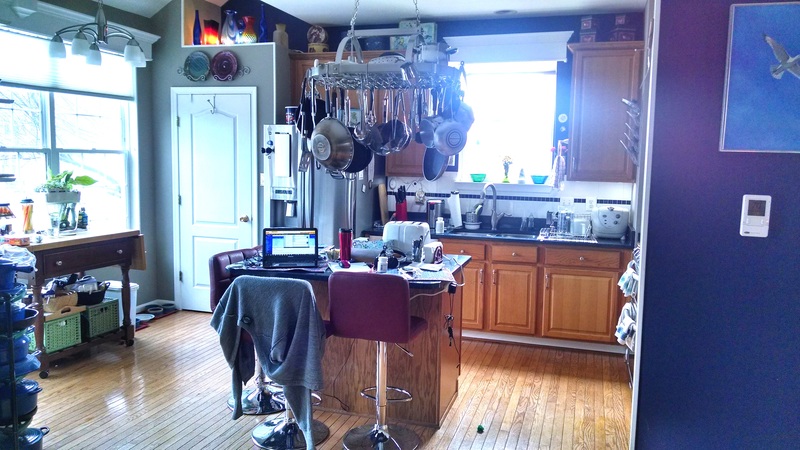 The kitchen, before and after. Here’s the bedroom wall looking into the hallway, with neutral Rockport Grey everywhere. Oh, we ditched the antique tv. 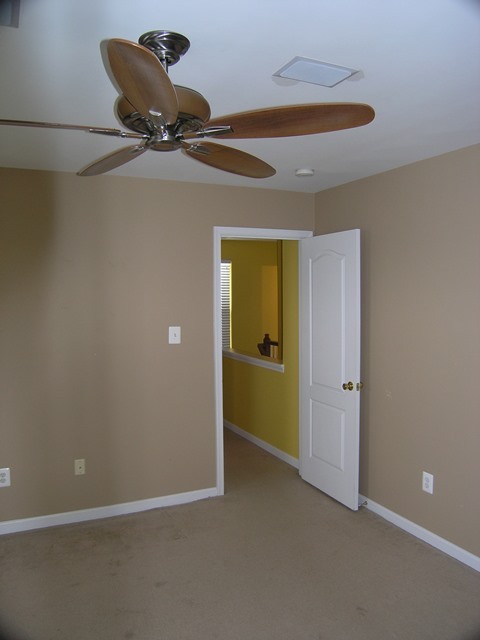 The original bedroom paint, kind of a suede brown. You can see that bright yellow in the hall.